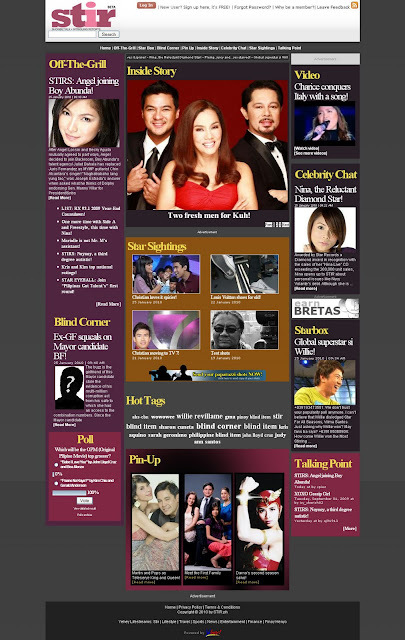 Weeks after the autonomous showbiz website went live on the World Wide Web on February 2009, STIR.ph has stirred the local entertainment-loving online community by bringing first dibs on shocking issues, intriguing proofs and photos, and full coverage of exclusive occasions. Fast-forward to present, STIR.ph continues to report exciting turn of events in the local showbiz scene and becomes the favorite online read of many. It is visited by more than 150,000 new users every month and receives a monthly page view of more than two (2) million. With such success, STIR.ph officially inaugurates the website and reveals its print magazine version to the media and its thousands of readers here and abroad. STIR.ph kicks off the year in full blast as it treats media and friends to a spanking party, themed Pink Carpet STIR Awards to celebrate its first year anniversary in the trade. The launch party was held at Zirkoh comedy & music bar in Greenhills, San Juan on January 26, 2010. The stirring Awards are given to artists and personalities who indeed created a stir in the last year. Awardees are: Christian Bautista - Stirring Artist of the Decade, Dr. Victoria Belo - Stirring Producer of the Year, Ryan Agoncillo - Stirring Host of the Year, Karylle - Stirring Star of the Year, and Juicy! - Stirring Showbiz Talk Show of the Year. Having a print version is STIR.ph’s another reason to celebrate! Young publishing company October Eighty Publications, Inc. teamed up with Yehey! to make the weekly magazine possible. The first two issues of the mag are free and will be distributed in MRT and LRT stations, coffee shops, salons and TV stations. STIR.ph website and magazine are prepared for publication by editors Edgar Cruz and Maryo Labad, respectively. STIR.ph (Showbiz Talk + Intriguing Reports) is a local Philippine entertainment gossip site that dishes out off-the-grill showbiz reports, star sightings, blind items, and user-generated contents such as candid celebrity photos and videos. Powered by the top Filipino online portal Yehey!, STIR.ph prides its speed in delivering entertainment tidbits to its readers online. STIR reveals local entertainment news as they unfold.